You Save: $27.76 (93%) Ships in 1 day. Soft Cover, 976 pages, 5x9. Fully revised and updated yearly, this guide features pubs across the UK that serve the best real ale. 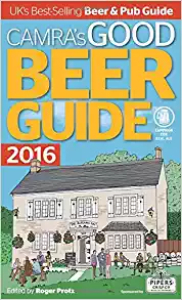 It is completely independent with listings based entirely on evaluation by CAMRA members, ensuring that each of the 4,500 pubs deserves their place, and that they all come recommended by people who know beer. The breweries section lists every brewery--micro, regional and national--that produces real ale in the UK, and their beers. Listings also include contact information, facilities listings and opening hours. Tasting notes for the beers, compiled by CAMRA-trained tasting teams, are also included.